It's time for my February Unblogged Files! Feb was kinda a low-key month for me - apart from Chinese New Year, it was just a nice routine of work, the gym, and spending quality time with friends and family. Perhaps not the most exciting or dynamic time, but a very happy - and food-filled - time for me. For a treaty weekday lunch, I snuck down to Earl Canteen. I know everyone goes on about their crisp pork belly sandwich (I've had it before and it is indeed nice), but looking at their menu, I was much more excited by the broccoli sandwich: long-cooked broccoli, smoked mozzarella, currant, balsamic & pinenut dressing. I do love the combo of currants and pine nuts! Unfortunately the filling looked a bit sad when it came out, with broccoli on only half the sandwich - but the staff there were so lovely and flat-out that I didn't want to say anything. 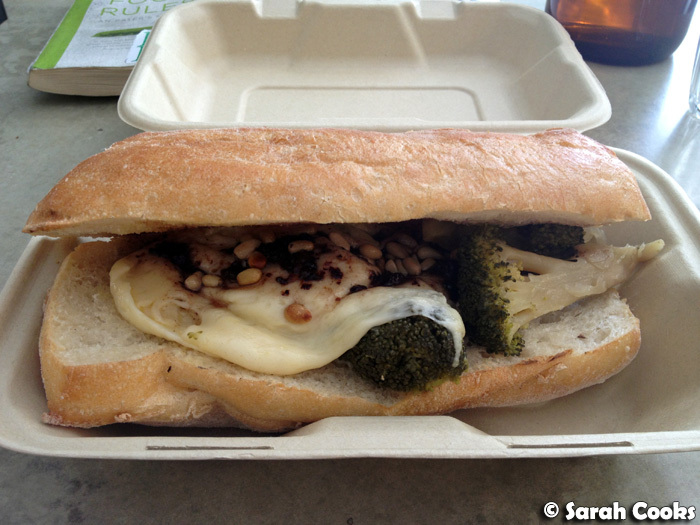 The flavours were great, and the serving was actually quite generous, it was just that the broccoli needed to be distributed across the whole panini rather than just on the one side. I also found the bread a bit soft for my tastes - I much prefer a robust and crusty roll. We spent a lovely night celebrating my cousin Catherine's birthday with dinner at Merchant Osteria Venezia and drinks at Lui Bar. 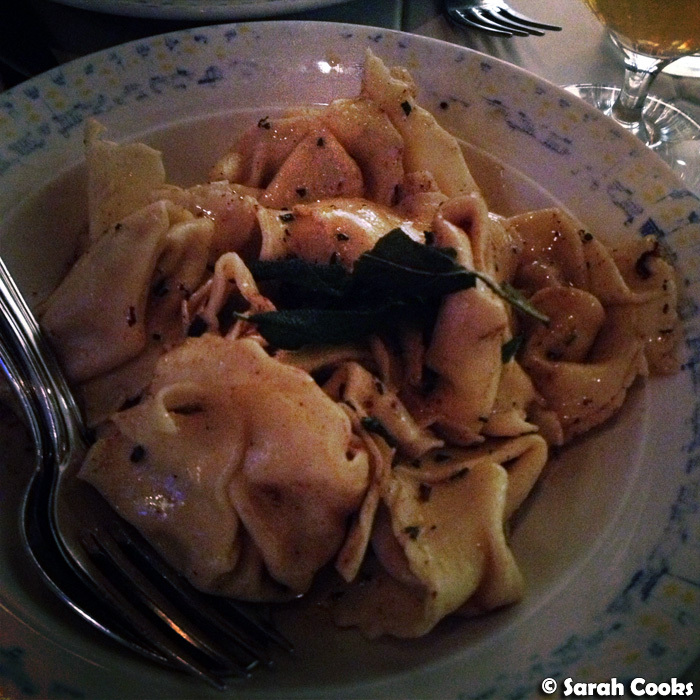 ...and the pumpkin tortellini, swathed in burnt butter and decorated with crisp sage leaves. The Lui Bar was great as well, with its crazy-good cocktails and stunning view from the 55th floor of the Rialto building. We loved it so much, in fact, that we visited again a fortnight later! Blogpost to come! Another month, another visit to Beatrix. Nat's such a great baker - her Moroccan Snickers tart was incredible! 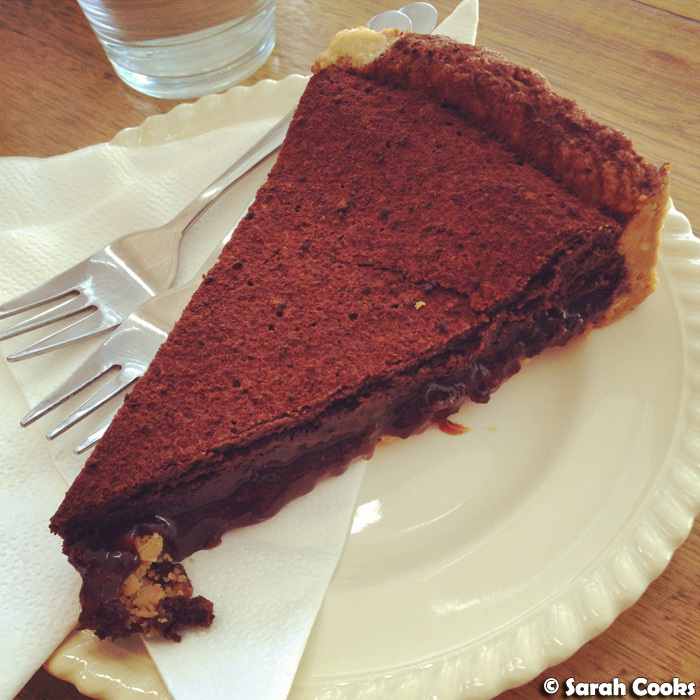 It's a chocolate tart, with date caramel and a peanut cookie crust. Wow! 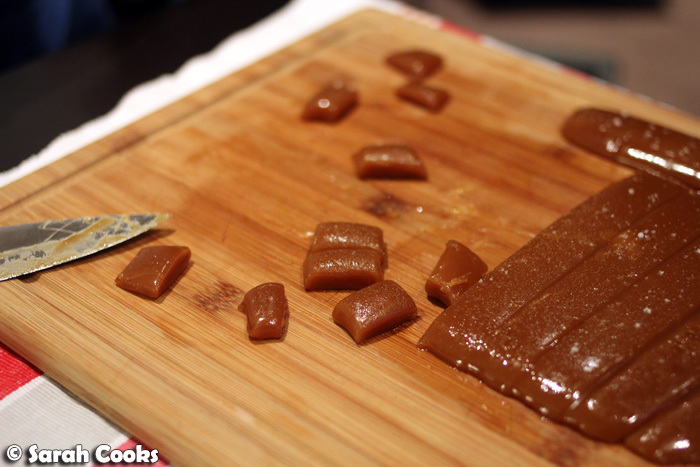 One night (the same night I baked the CNY peanut cookies, actually), we made a batch of David Lebovitz' salted butter caramels. 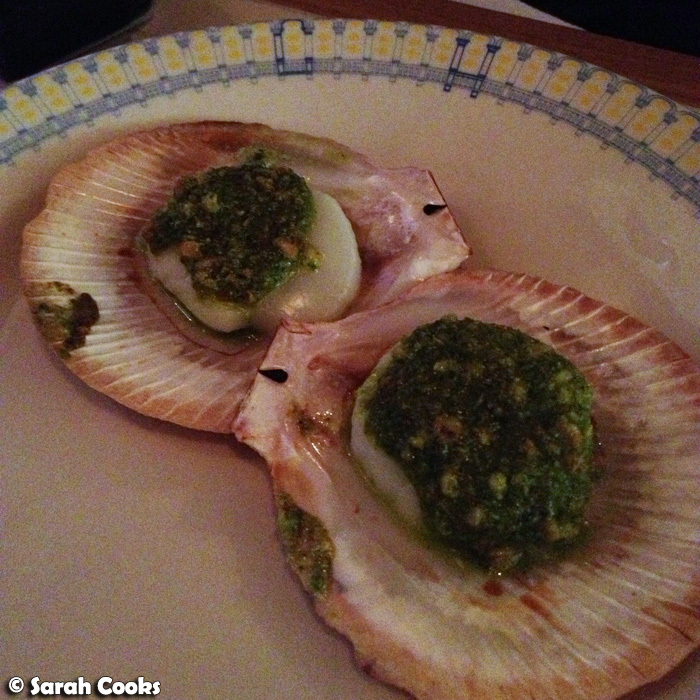 Wow - total deliciousness, especially with the little snowfall of fleur de sel sprinkled on top. Do it! 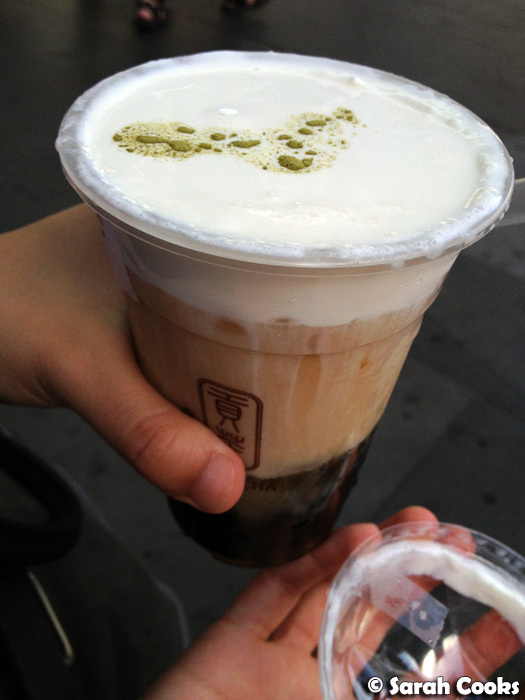 I tried Gong Cha bubble tea on the strong recommendations of my friends - the salty milk foam was strange for me at first, but now I love it. 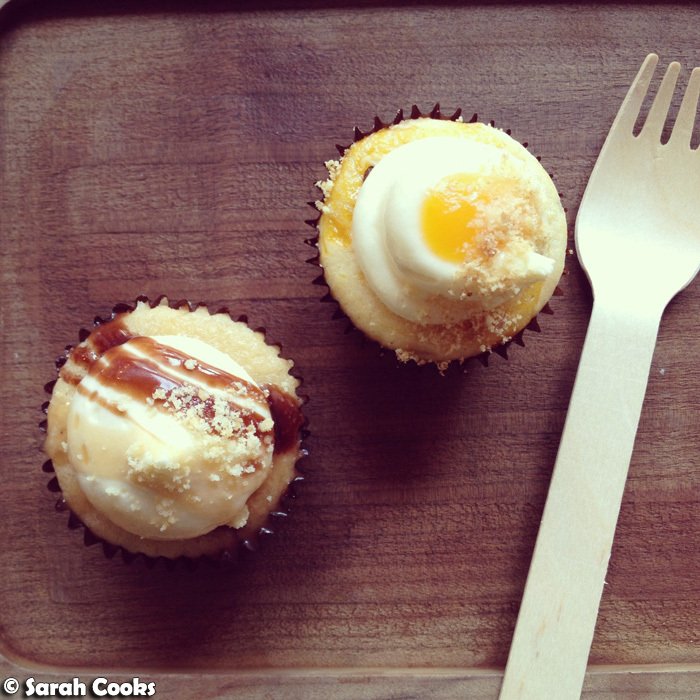 Another midweek treat for me was a stop-in at Cupcake Central. I think these are the best cupcakes you can buy in Melbourne! Loved the passionfruit/mango and the banoffee pie flavours. 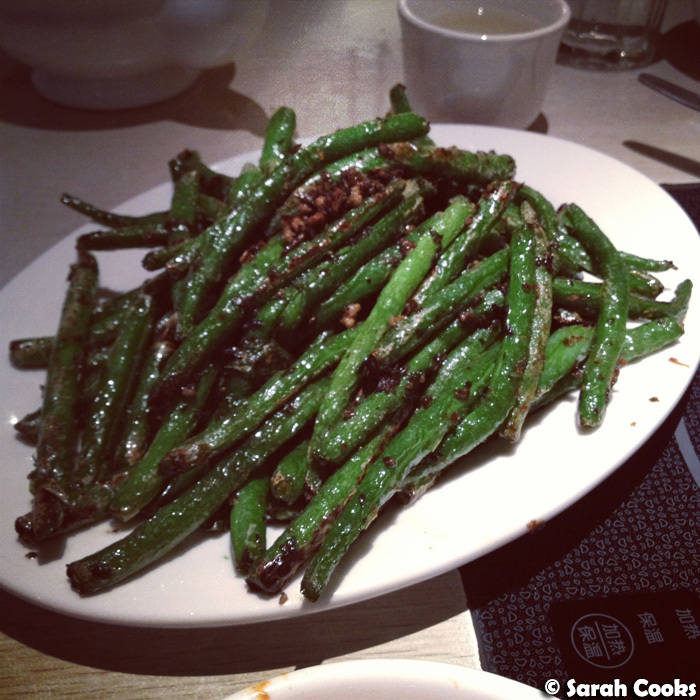 Gong Bao chicken and beans with minced pork at the new Dainty Sichuan in the CBD. Oh yes. We fueled up for a road trip by stopping in at Baker in the Rye, on Carlisle Street. 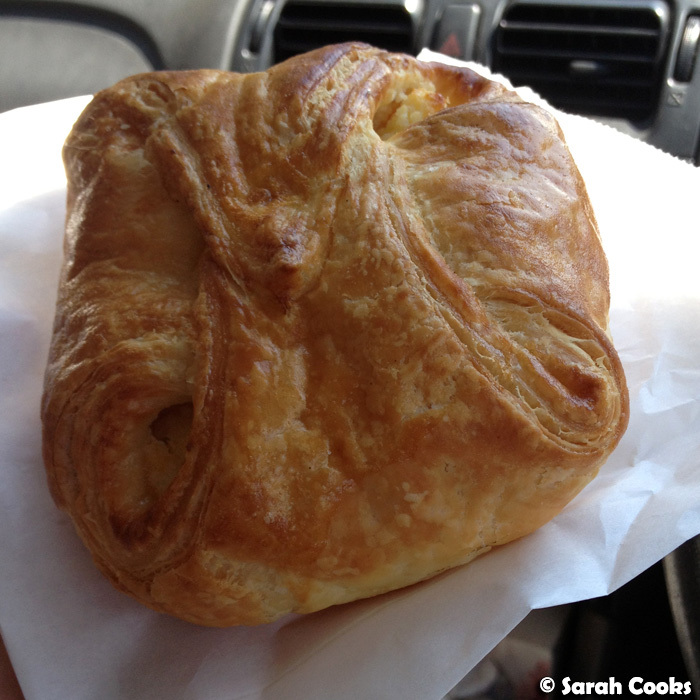 Having already eaten breakfast, I wasn't going to get anything for myself - but then I saw a sweet cheese pastry and was sold! I fell in love with Topfenstrudel during my travels in Austria, and now I can never pass up the opportunity for one when I see something similar here! I also loved how the Russian ladies working at Baker in the Rye just didn't give a crap about the customers and kept chatting away in Russian while they were taking our orders, hehe. 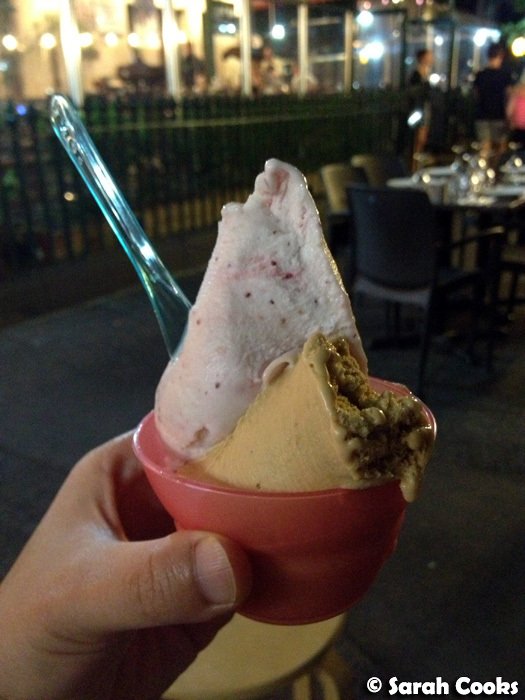 On a warm night, we drove across for an ice-cream at Helado Juaja on Lygon street. Whilst my ice-cream was nice (particularly the dulce de leche with walnuts! ), I felt it was very overpriced, and the pricing system was quite confusing. They have "premium" and "basic" flavours that are different prices, and bizarrely they charge you 10 cents for a spoon and 50 cents for a cup. (How else are you going to eat it - with your hands?) That small cup you see above was $8.50! Good ice-cream, but I probably won't be going back any time soon. I caught up with a friend for a quick lunch at Bali Bagus on Franklin Street. I don't often eat Indonesian food, and was really impressed by the sambal chicken - juicy, tender meat with crisp skin. I added a fried egg because I am Asian and that is how I roll! 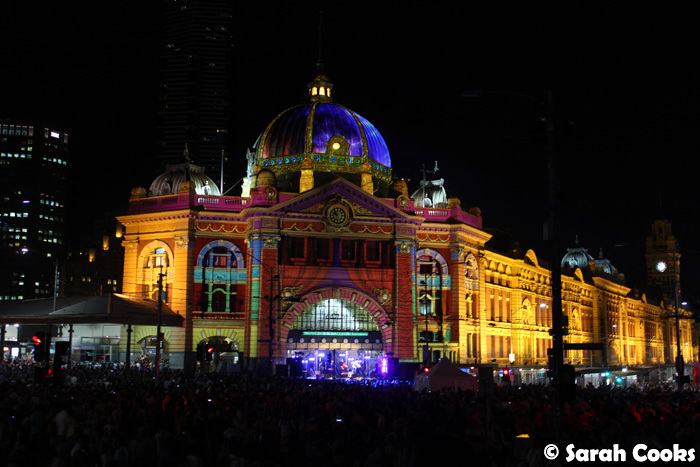 Like all of Melbourne, I was in the city for White Night. 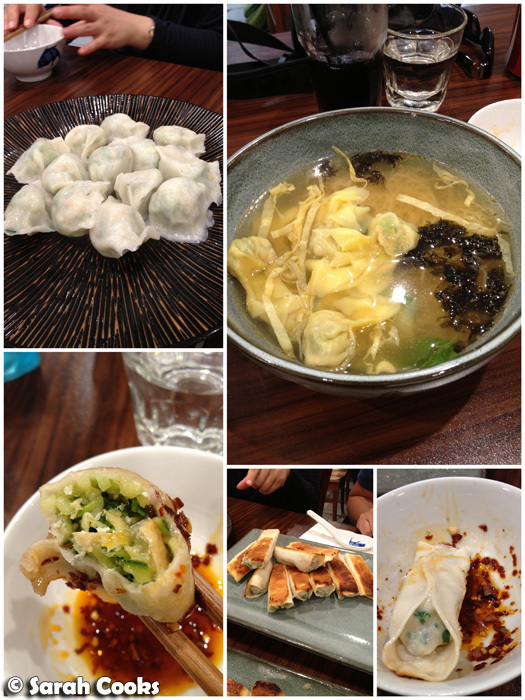 But before checking out all the lights and art: DUMPLINGS at Shandong Mama! After reading endless gushing posts about it on Twitter and blogs, I was keen to try it. 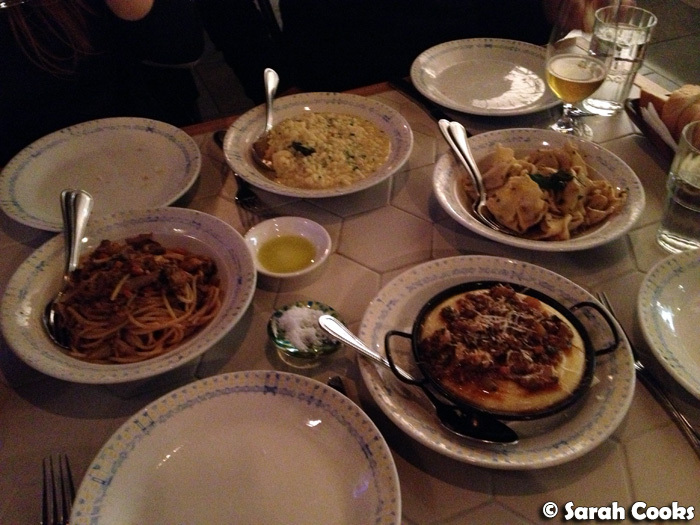 The staff were really friendly, but the place was unbearably noisy and we had to shout to make ourselves heard. (Probably not the best place to catch up with friends I hadn't seen in months!) The dumplings were very good, including the vegan zucchini ones (yes really! ), and the open-style pan-fried ones (we tried mackerel, and beef). Finally, one morning last week I got up at the crack of dawn to attend the launch of the breakfast menu at the Meatball and Wine Bar. (Disclosure: this was complimentary). It was a lovely morning catching up with fellow food bloggers and tweeters before rushing off to work. The concept is quite simple: you choose your egg balls (creamy; charred corn and cheddar; or green), choose a sauce, and choose some sides. Or you can go the slider-route! The ladies I sat with all chose balls-and-sides, and I chose the super-cute sliders - creamy egg balls, bacon, and Italian tomato sauce in a lightly-toasted brioche bun. (There were 3 in the serve). 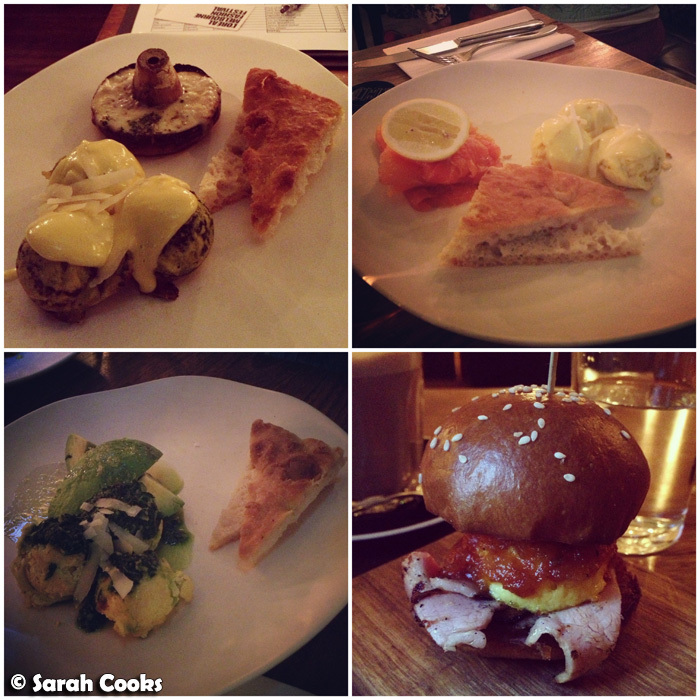 You can read Gastronomel's post about the breakfast on her blog. And we're done! I'm going to try to keep March low key - cafe catch-ups, a spa day, having friends over for cake, avoiding going out too much - but we'll see how that goes! Seriously love your monthly reviews hehe of all the new and old places you've gone too ~ I need to make a trip back to Beatrix! Love her baked goodies! And i am MAKING those salted caramel SOON! Mmm so much food! I'm addicted to gong gong cha cha too! I love this overview of unblogged eats of your month! 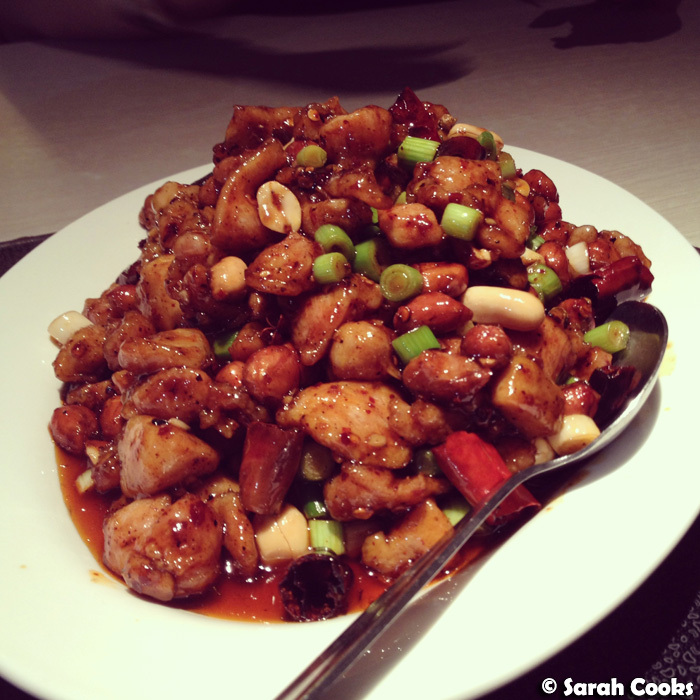 That gong bao chicken looks so so so good. 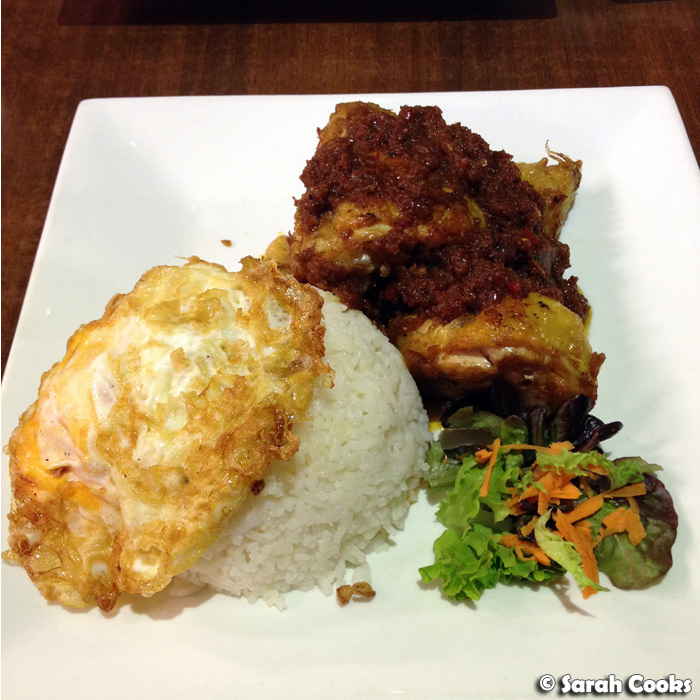 And the fried egg with the sambal chicken!